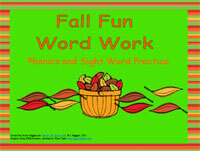 With all of the leaves changing color, fall is a perfect time to teach preschoolers colors. It's also a great time to teach early readers to be able to recognize color words. For many children, color words are some of the first words they add to their reading and writing vocabulary. In our house, we have a two year old who is learning to identify and name colors. We also have a four year old who is beginning to notice color words in print. Every morning while he is coloring, I hear him trying to decode the words that are on his crayons. It cracks me up when he spends forever trying to figure out the brand name of the crayon! While these books aren't about fall (you can find a great set of books about fall here), they will help you enjoy learning about the colors of fall. Brown Bear, Brown Bear What do You See? is a classic introduction to color words. Each page in this book features a single animal with one color word. The repetative text makes it easy for children to join in. The simple text makes this a great first choice for children who are learning to locate color words within text. Freight train by Donald Crews is the perfect introduction to color words for any train lover. This story uses 6 basic colors plus gray to build a train. (fyi- where we live, kids are expected to know the color gray on the pre-kindergarten assessment). As the train moves down the tracks, over a tressle, through tunnels, and past buildings, the colors blur to form a rainbow train. This book introduces train vocabulary as well as color words. It is a Caledcott Honor book. How do Dinosaurs Learn Their Colors? by Jane Yolen if your child is more of a dinosaur lover, try this book to introduce your little learner to color words. This story is part of the "How do dinosaurs..." series by Jane Yolen. This particular book has a less sophisticated plot but it's simple text makes it a great choice for children who are learning to read color words. There is just one dinosaur on each page and the dinosaur has something of a given color-- a purple towel for example. The text of the color word matches the color-- so purple is written purple. This gives the children a little extra support. This story focuses not only on colors but also on opposites, spatial relationships, and descriptive language. Children will have the opportunity to practice several color words, though, as they look for the green sheep with in the pages of red sheep, blue sheep, and also near and far sheep. Children will be amused by bath sheep or band sheep. I love how Mem Fox can take simple preschool concepts, make them so engaging and throw in a little humor to make kids fall in love with her writing. My boys have requested this one A LOT! The Deep Blue Sea: A Book of Colors by Audrey Wood This book gradually zooms in on a rock on a tiny island and introduces one new tropical item at a time to the scene. It also introduces a new color word each time. One thing I enjoy about this book, is that it fits in all the colors of the rainbow and gray and white! This is a cummulative story so the constant repeating while encourage children to join the story. This book was a favorite when my oldest son was a baby. He loved the rhyming verses and the repetative sounds. The large pictures involving many colors were engaging too. Now that he is four, I've reintroduced the book and he still love the story of a "talking" crayon box. Twelve colors are introduced as a girl draws a picture for each one. I like that this book introduces some different sets of colors like silver and brown. Those colors often get left out of books about rainbow colors... but they never get left out of a box of crayons! This lovely book is written in Spanish and English which gives children an opportunity to practice color words in both languages. In this story, a little girl explores colors in a dusty southwestern desert. Even though much of her world is covered by sand, she looks hard to discover hidden colors like the hot pink sky at sunset. Mouse Paint by Ellen Stoll Walsh is a fun look at how colors are made. The book starts with three white mice on white paper without any color. Gradually, the mice take a dip into pots of paint, covering themselves and spilling paint onto the paper. The colorful mice then get mixed up in the pools of paint, showing us what happens when colors like blue and yellow mix. The book also has a fun ending that is great for helping children to learn to infer. 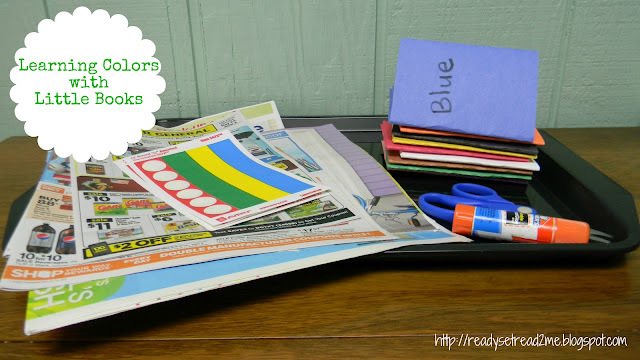 Want more learning colors fun? Color Learning writing activity for preschoolers- early readers. Here's a fun color activity for any age! Here's a priced lesson in my Tpt store for teaching children to read and write color words. 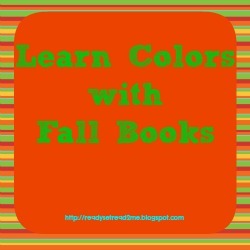 Yes, fall is a great time to teach kids about colors, especially with the colors of the leaves changing. You shared some of our favorites! Plus, we discovered some new ones too. I'll be sharing how we used Freight Train to reinforce our color learning on my blog soon!